The school year is in full swing. I had a bit of a shaky start and that is why it seemed like I disappeared. We have a lot of new staff to include a new principal, new psychologist, and Learning Resource Teacher. The new Learning Resource Teacher just started a week ago and a substitute teachers took her place until then. As if that weren’t enough, rooms had changed over the summer and the resource room was a newly emptied room. That doesn’t work very well for a substitute teacher and many of you may relate to when chairs, tables and desks are not in rooms they are up for grabs. I was left with the duty of getting things found and organized so a teacher could use the room with students. In the spirit of “Good Thing” and “Bad Thing”; new procedures can be put into place because there is no one left to remember the old ways except me, but I am also the only one that is familiar with the history of the special education files and students. I felt like I had to wear many hats. We also have a new program to complete our special education paperwork. This is really challenging my ability to be flexible and learn something new . It is making me go through the procedures we tell the students to do; deep breaths, count to ten. It is not OK to scream. This school year. I have pretty much the same population as last year; 2 Life skills classrooms, general education K-5th, and a charter school K-6th. I am doing push in for two Kindergarten classes and the 2 Life skills classrooms. The need for social pragmatics groups continues to grow. I am team teaching 3 social pragmatic groups with the help of the school counselor. 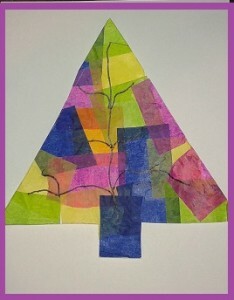 We are implementing material from 2nd Steps, Michelle Winner’s materials, and other things we find. 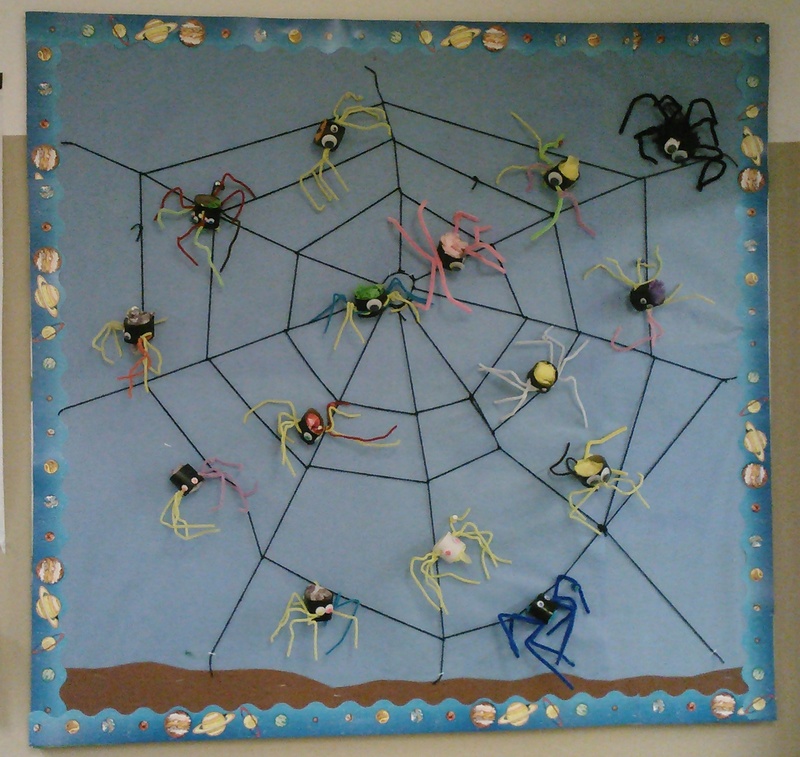 So getting on to the topic, We have been completing spider related activities. Many of you may be familiar with the Spider Web Activity where students form a circle and toss a ball of yarn across while continuing to hang on to the yarn with one hand. This creates a spider web in the center of the circle. I have used it in the past for concepts such as across, left hand, right hand, over, and under. It also works for teaching the social pragmatic groups the importance of working with a group. If a student doesn’t keep their mind and eyes with the group, they drop the yarn and the web becomes messed up. We have been talking about how you need to keep your eyes, your ears, your brain, your body, and your heart with the group so everyone can learn and work together. 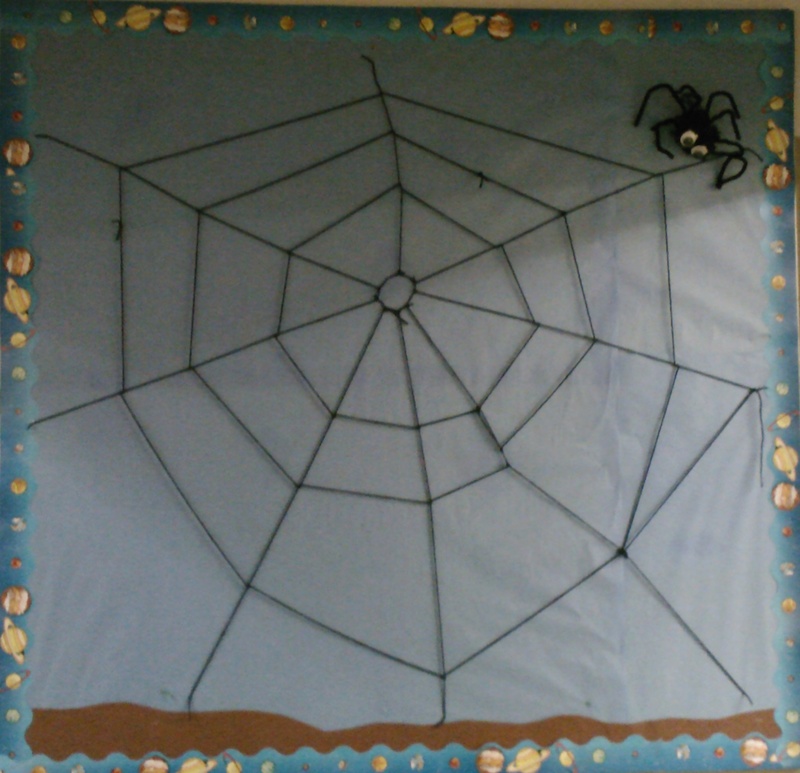 I came across this spider and decided it would make a good bulletin board project. http://momitforward.com/craft-toilet-paper-spider . It met my requirements for materials that are easy to find and cheap. I found the eyes at the dollar store and already had the paper rolls and pipe cleaners. I bought a can of black spray paint from Wal-Mart for a total cost of $3. I made a spider web out of yarn. and just stapled it to the bulletin board. It is looking like this. I added my pom pom spider from last year. 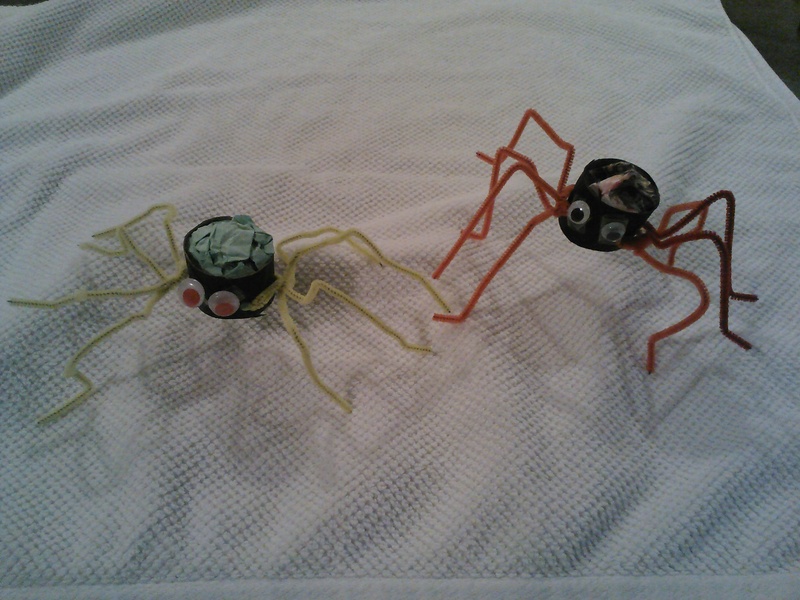 The students will make spiders that look like this and add them to the web. I added the crumpled paper on the back for some color. I like my bulletin board activities to cover as many therapy objectives as possible. I use the free app Story Kit to make pictured directions that my older students can record. The younger students will practice following directions and understanding the sequence. The spiders also provide opportunity for problem solving and telling directions. It is easy to see how they are made by just looking at them because the parts are all visible. The Story Kit directions are in the process of being made so the audio is not all available yet. Story Kit formulates a storyboard that can be shared. http://iphone.childrenslibrary.org/cgi-bin/view.py?b=rpdpipex66oskuofy2ua The app formulates a book with pages on your device. Here are places for the fish origami directions. January was a very busy month. 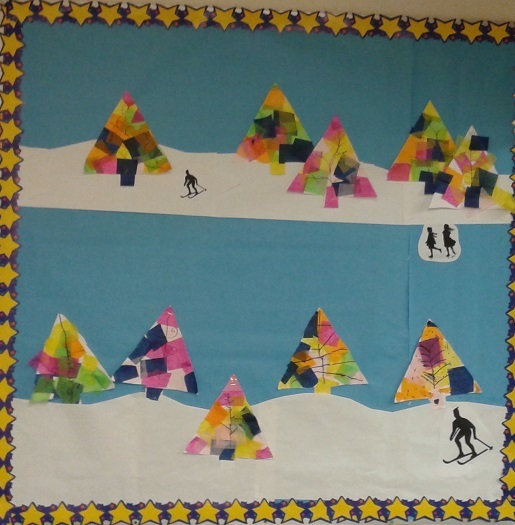 I didn’t get to my usual bulletin board project. I ended up putting up snowflakes from a previous year. 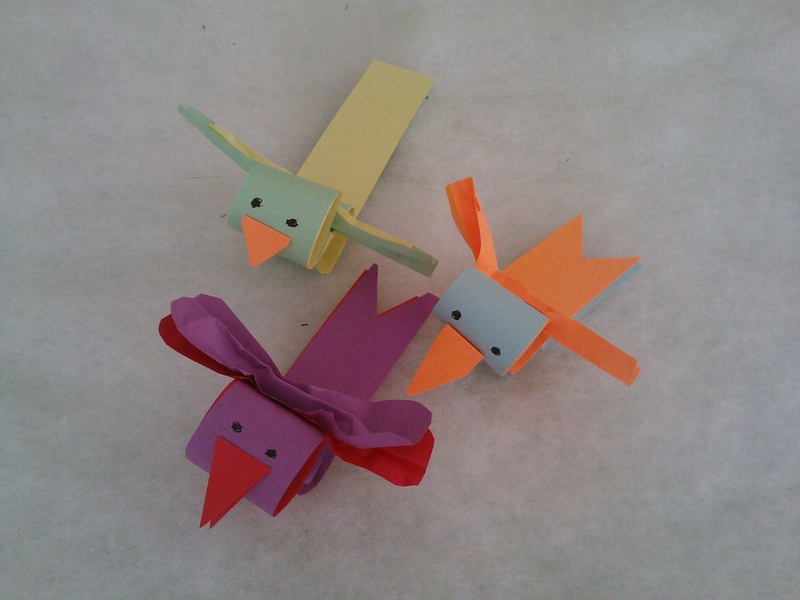 The students always look forward to the crafts so I didn’t want to disappoint them by skipping another month. Besides Valentines Day is the perfect time to bring out the glitter. Here is a picture of the bulletin Board by the end of the day. It is time to change the bulletin board again. The students really seem to enjoy these projects and ask each month what we are going to do next. I like them because they can encompass so many objectives from speaking clearly with detail to following directions. I think they like using the art supplies since there is not as much time to do art in the classrooms. These same students often have difficulty following directions and get lost in a large group. In a small group they can all be successful. I obtained my materials from a lot of different sources. I found a hat on this web site and shrunk it down to a usable size. 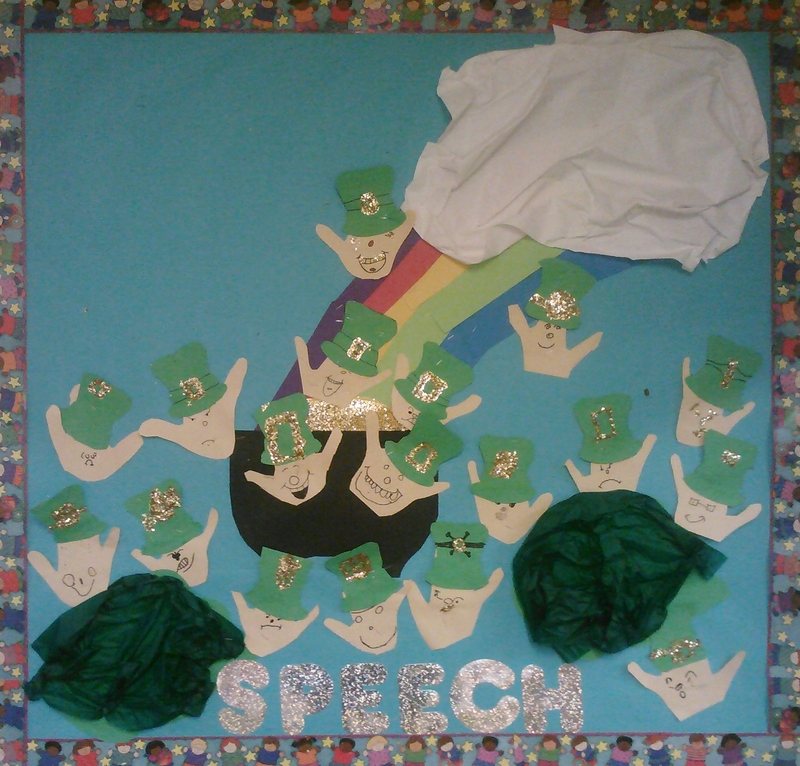 Leprechaun_Hat. This site taught how to draw facial expressions. I used Story Kit to record the directions. This time I had the students take pictures of the project and make the story themselves. It taught them about sequencing and providing important detail. You can access their directions here. Leprechaun Directions. It took two sessions to accomplish everything. 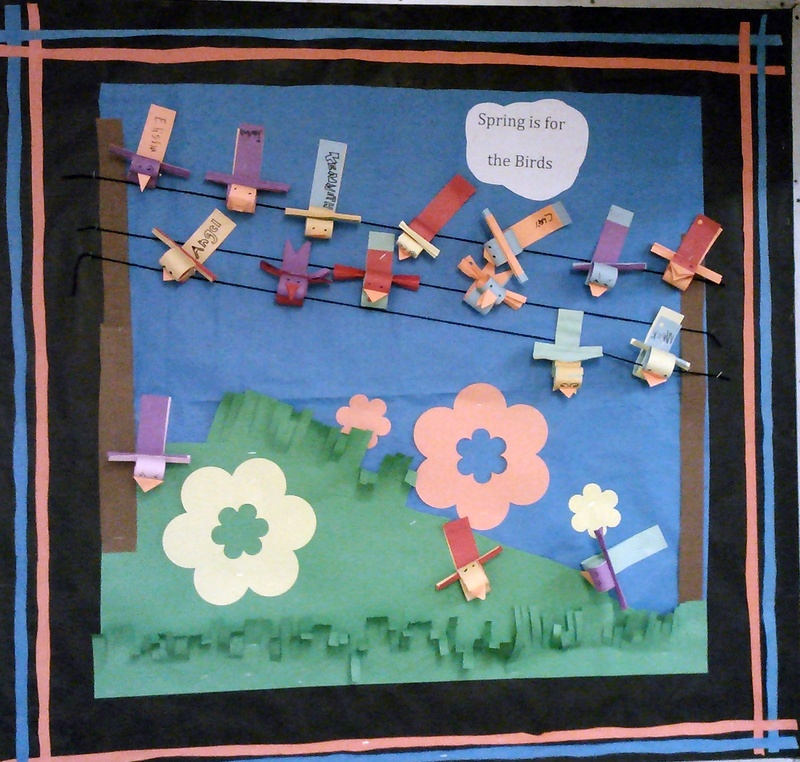 Not only did it make interesting therapy sessions, I have a new bulletin board for March. 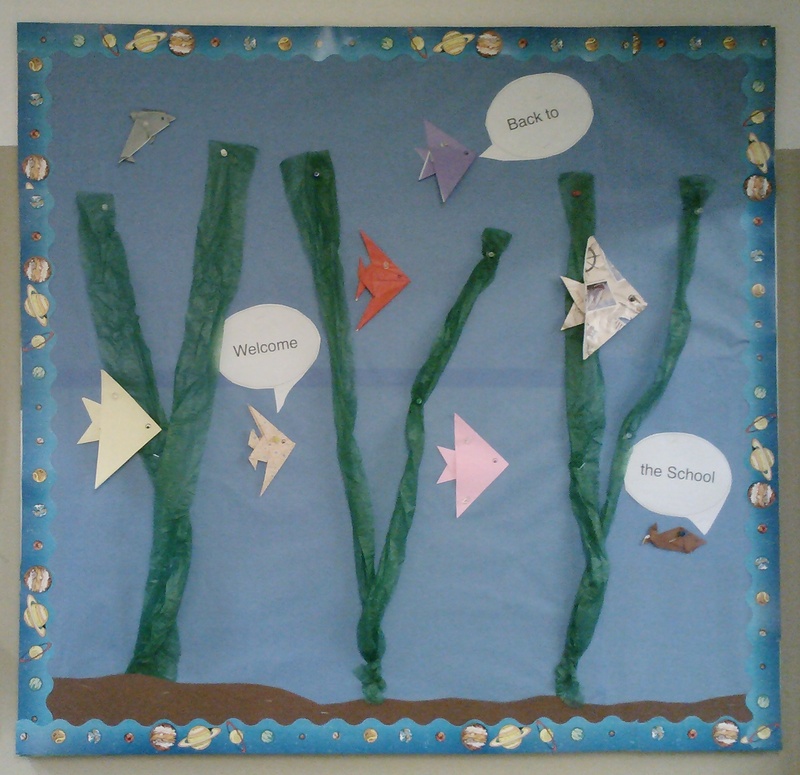 Here is a picture of the bulletin board. This is really an update for the paper ornaments mentioned below. I had so much fun learning about this tool that I wanted you to be aware of it also. It is a free app for the iPad called StoryKit. I didn’t have the opportunity to explore its capabilities until now. I was trying to figure out the best way to provide directions for the paper ornaments and it came to mind. I am impressed. It was easy to use and I can see a lot of potential for making sequences and having the students make their own stories. The stories can then be saved on a server for future use. 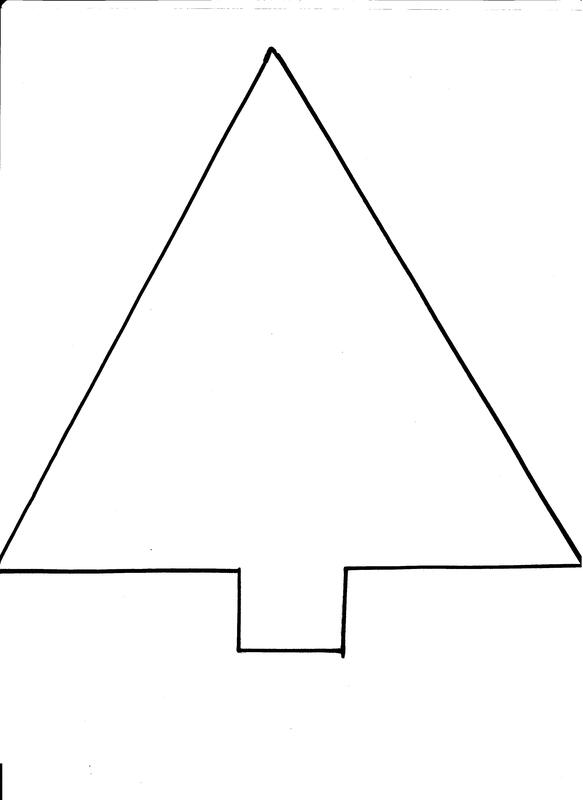 Here is the link for the directions for the ornaments. On your iPad it will actually look like a book that you can turn the pages on. It is also possible to add audio to each page. I woke up to freezing rain conditions, no school, and time to be creative. I need to switch my bulletin board away from the December/January winter theme to something for February. I like to be able to get some language value out of it as well. The Pear Tree (previous post) has always been very successful for making students think of homonyms. I thought something similar for antonyms would be great. 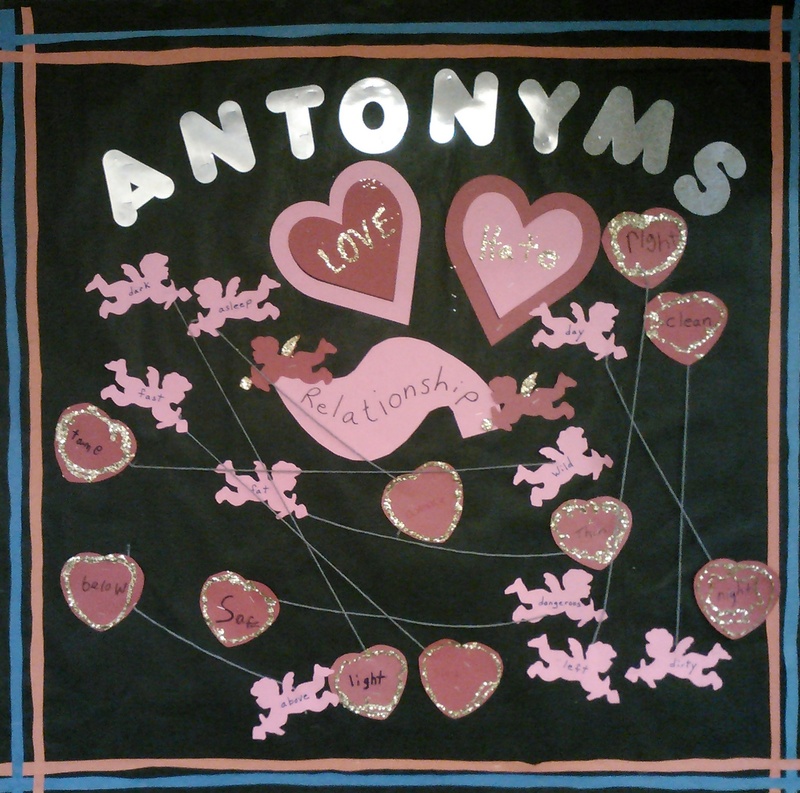 I’ve decided to make the title “Antonyms, a Love and Hate Relationship. I will cut out hearts the student can decorate with a stickers, stamps, or drawings. They can label them with antonym pairs and post them on the board. It could be made more interactive by cutting the hearts apart in puzzle fashion to be matched or making two different colors of hearts that are joined by a piece of yarn or string. Antonyms are a good way for students to learn vocabulary and the ability to compare and contrast. The mind seems to remember words better when we manipulate the meanings in our mind. Older students learn how to use suffixes and prefixes to make words that are opposites. I have made up a list of antonyms that is in pdf form or excel. There is an advantage of being able to sort the excel list, but I’m not sure it will open for everyone. The number to the right of the word is my way of giving a level. The 0 level is typical preschool kindergarten beginning knowledge. I have K through 5th grade in my building. The basic antonyms are developed in primary grades and there may be fluctuations in the grades they are learned depending on what material is covered in class. I’ve found that by making a list I can write objectives in their Individual Education Program (IEP), show progression and know what the student has covered. Click here for the excel list, click here for the pdf list. I found glitter to be quite motivating. I put glitter in a coffee can so I could seal it with a lid. 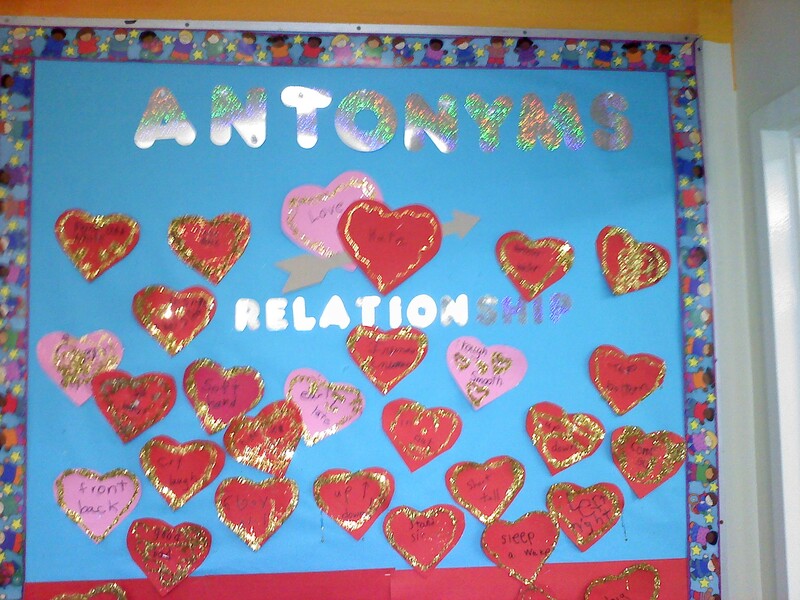 I let them put glue around the outer edge of the heart after they wrote the antonyms on them. They slipped the heart into the coffee can and shook it. The heart came out decorated with glitter and looked good no matter what the skill level. It only took a few minutes per child and surprisingly there wasn’t much clean up. This is how the board is looking.